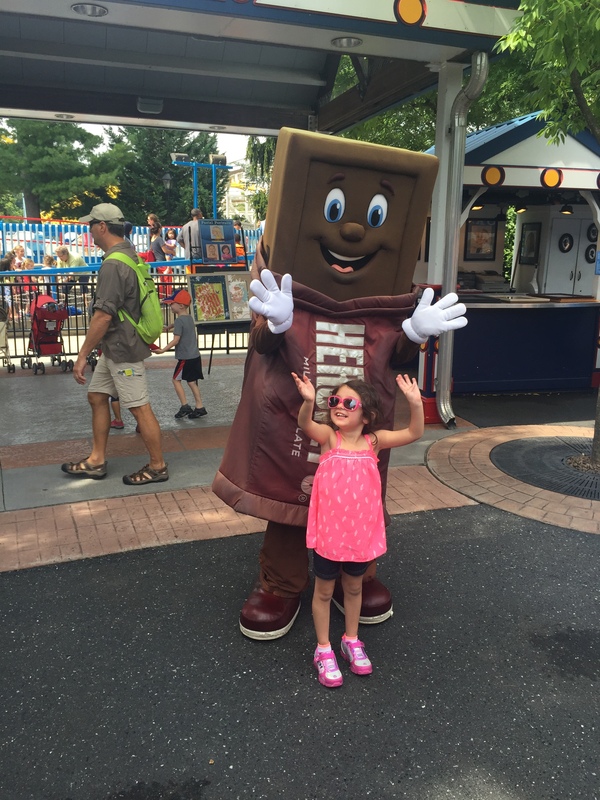 After checking out Chocolate World just a short walk away was our true destination for this trip Hershey Park. Now I will admit that my wife and I are not big thrill ride fans so most of the crazy roller coasters they have here are lost on us. But our daughter loves the little kiddie rides and I’m having panic attacks about potentially having to go with her on bigger rides when she’s older. For now we get to do the nice easy things like meet Mr. Hershey Bar. 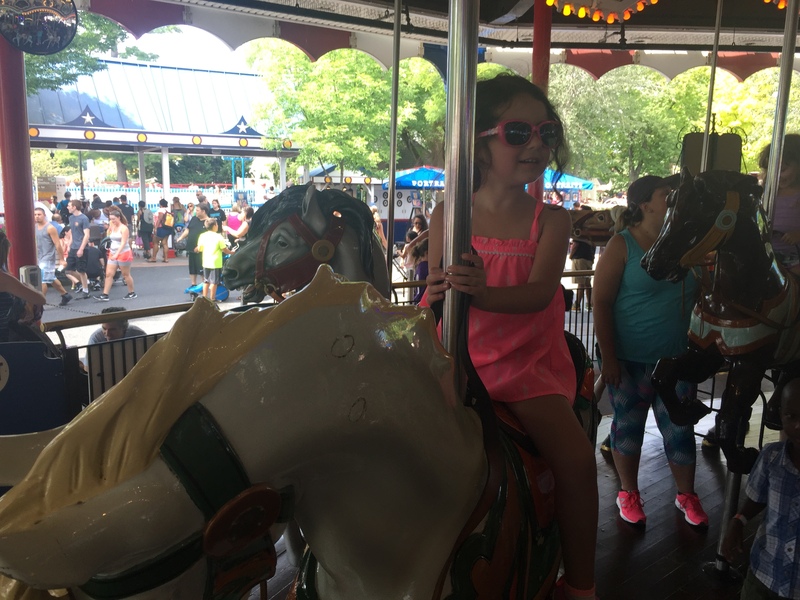 Not to mention Hanna’s absolute favorite thing to do a classic carousel. We do make it on some of the more “boring” rides like cable cars, the monorail, and the odd log flume ride. The day we were here actually was a really hot day for this late in the summer, and Hanna really wanted to just play at the Boardwalk. My wife volunteered to take her through water park area and I was able to sneak off with our younger daughter Melody (8 months old) to wonder around the park. This was to accomplish two things. 1) Melody was pretty cranky due to the heat and trying to get her to take a nap was top on my priority list. 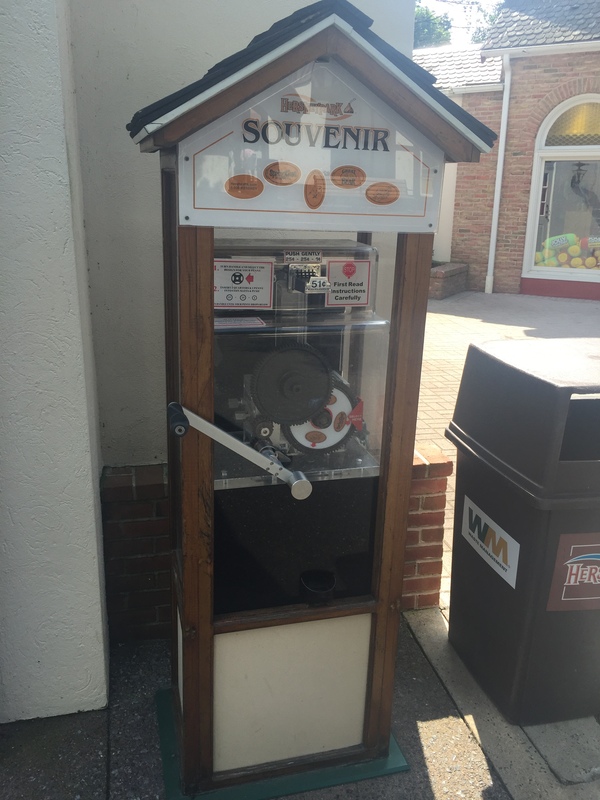 2) There were penny machines to be found. 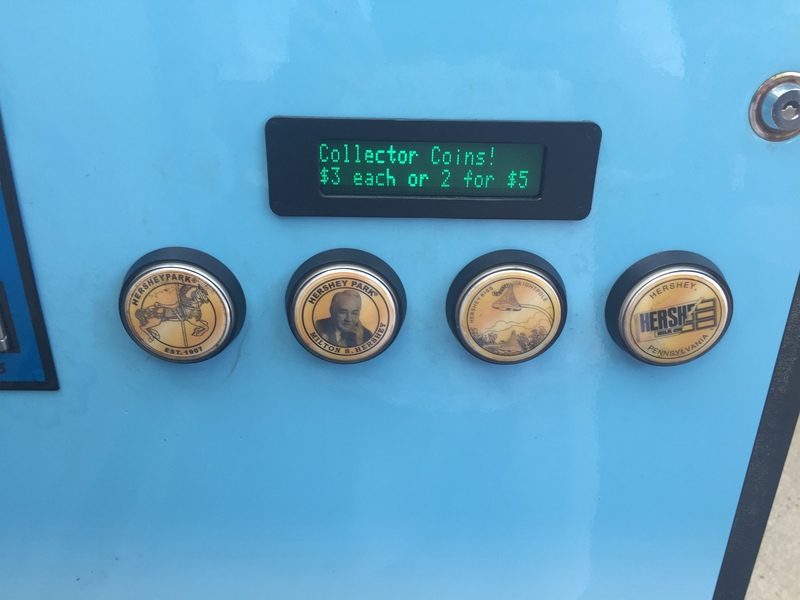 Now I didn’t collect these machines in this order, but I’m going to review them as you would after first entering the park. 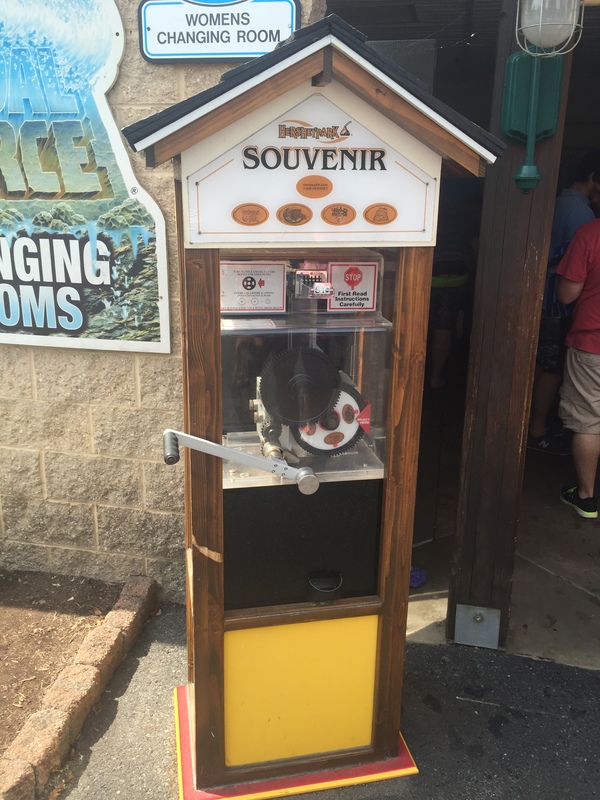 As you go through security and have your admissions ticket scanned you will immediately find the first two machines. The first one is on the right of the main path just outside one of the many souvenir shops. I will apologize now for not having actual pictures of the final pressed pennies. All of these coins were collected on a previous visit a couple of years ago and the designs have not changed. Due to this I didn’t press any new sets since I already have a few of each in my collection which unfortunately is all packed away as my family is getting ready to move. 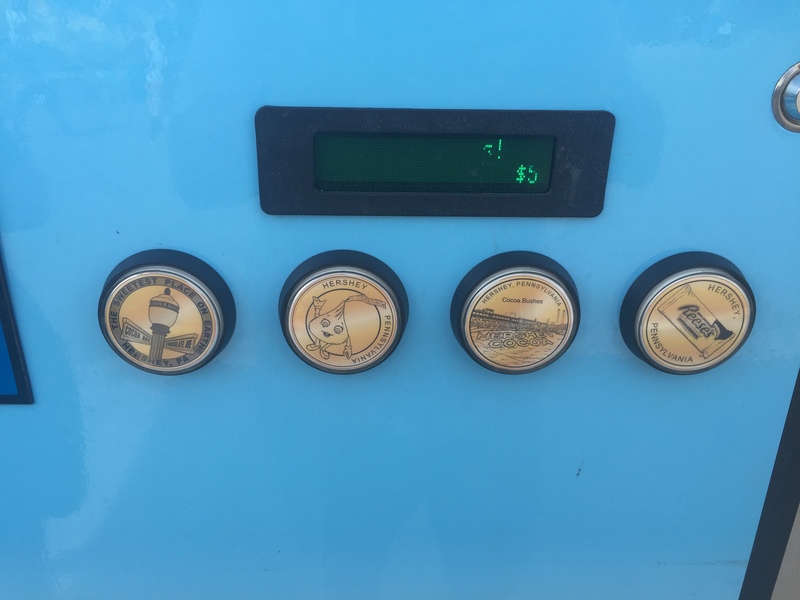 So instead I took close-ups of the machine marquees that show the coin designs. 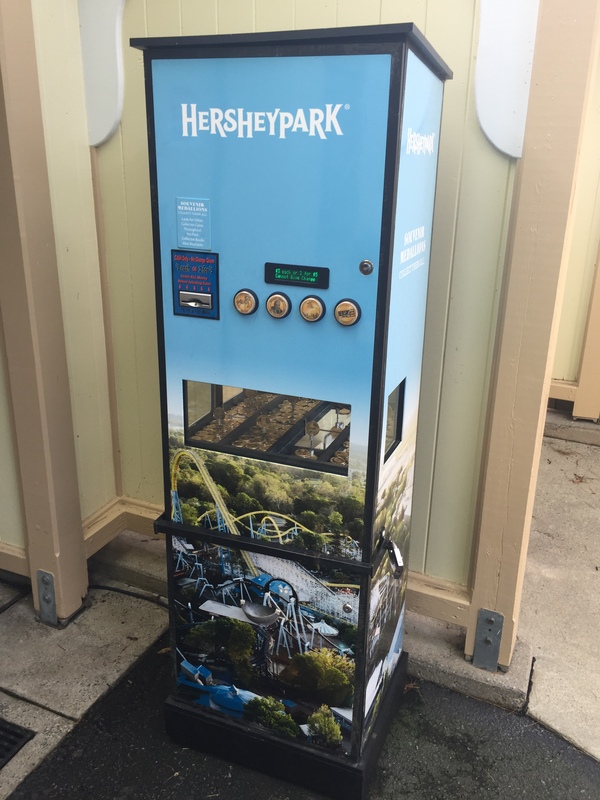 Back to the machine, the set available here includes Springtime in the Park, Ms. Hershey Kiss, Great Bear Roller Coaster, and the Storm Runner ride. The second machine is on the left side of the main path. This may actually be easier to collect on the way out depending on the crowd level when you first enter. 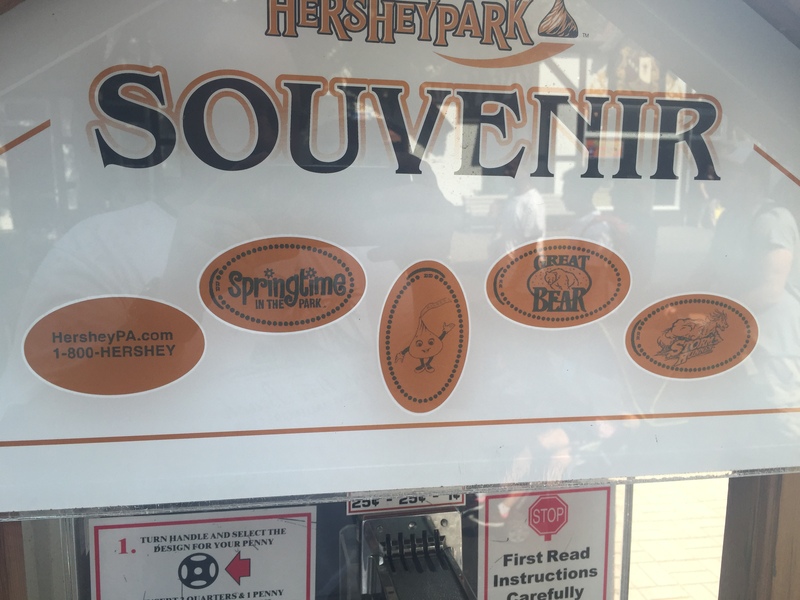 The designs available at this second machine are the Kissing Tower, the Reese’s Peanut Butter Character, The Wildcat Roller Coaster, and a Hershey Kiss Street Light. By the way in case you are wondering about the Street Lights these actually exist and are located all around town see picture below. After walking up the first big hill in the park you come out in the main kiddie ride area. Near Starship America and the Carousel is the third machine. Just due to where this machine is located there are always a lot of kids around it. To be honest not many are ever actually using the machine but they always get a kick out of watching when it’s used. I always make sure to show them how it works and the finished products then they quickly run off to ask their parents for spare change. 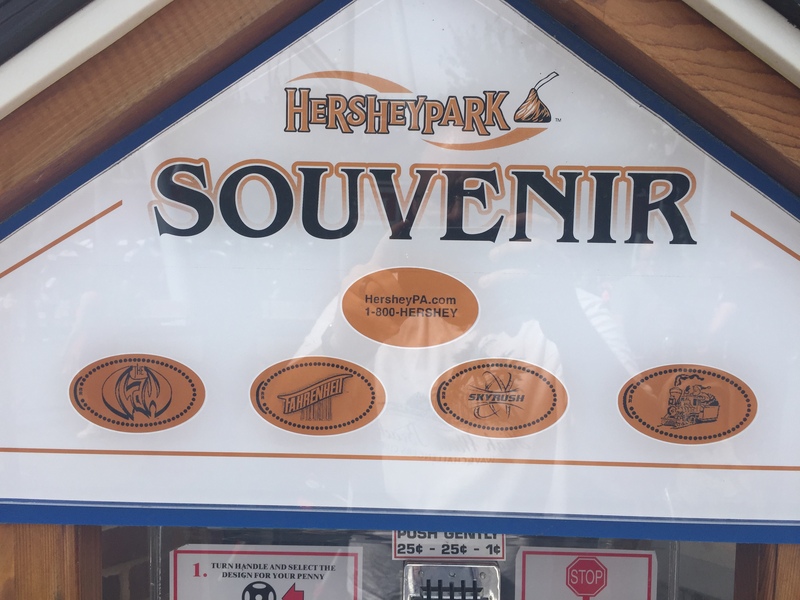 This set includes the Hershey Bears Logo (Minor League Hockey Team), Mr. Hershey Chocolate Bar, Hershey Park Logo, and a Carousel Horse. To find the next machine you have quite a walk ahead of you. It’s located way over toward the Boardwalk and is just outside the bathrooms/changing rooms for the water flume on steroids ride called Tidal Force. 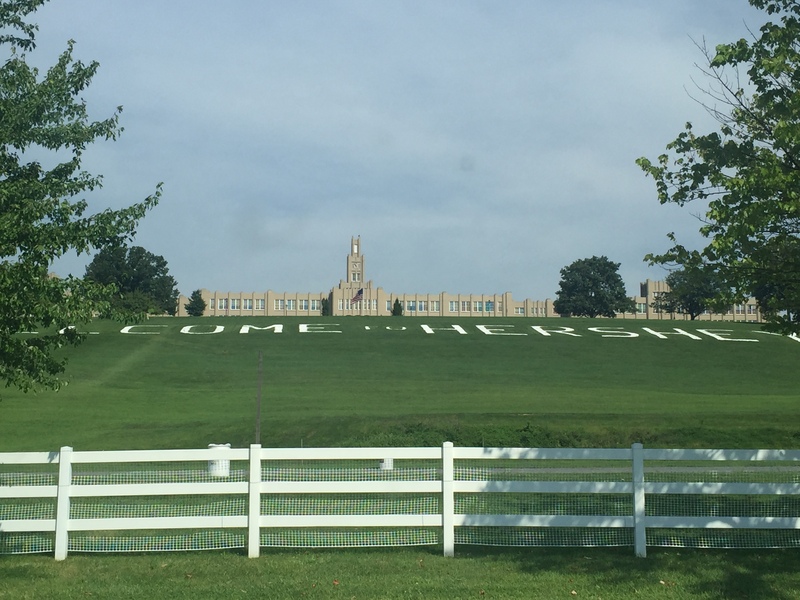 A word of warning about this area. 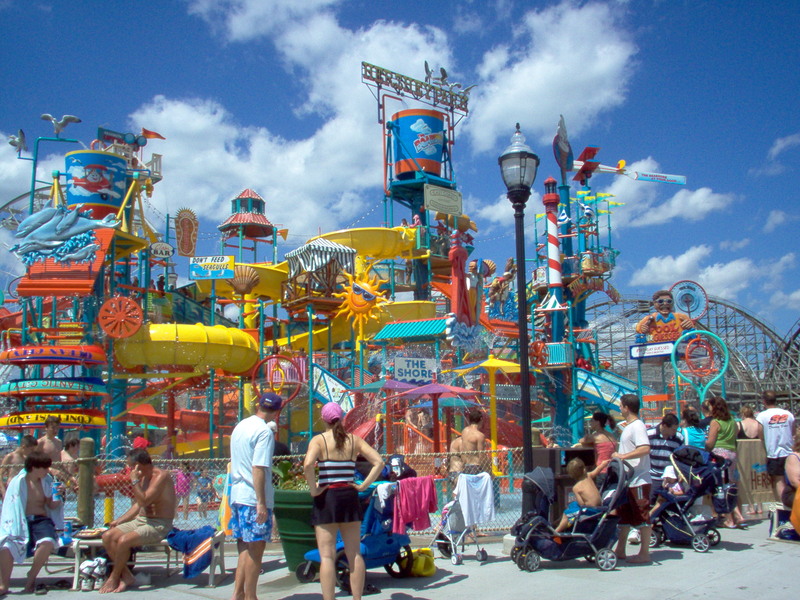 The ride Tidal Force has a splash area that includes part of the pathway that surrounds it. When the ride vehicle comes crashing down there is a huge wave of water that splashes down over some suspecting (and non-suspecting) visitors. This machine is thankfully out of the splash zone, but just beware in case you don’t want to get wet. 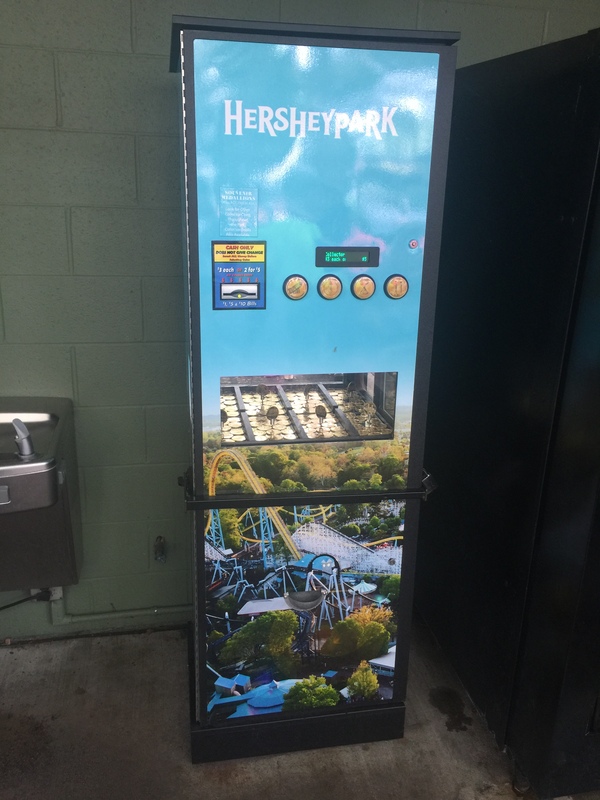 The pennies at this machine have images of Hershey Park in the Dark, Lightning Racer, Wild Mouse, and Tidal Force ride logos. 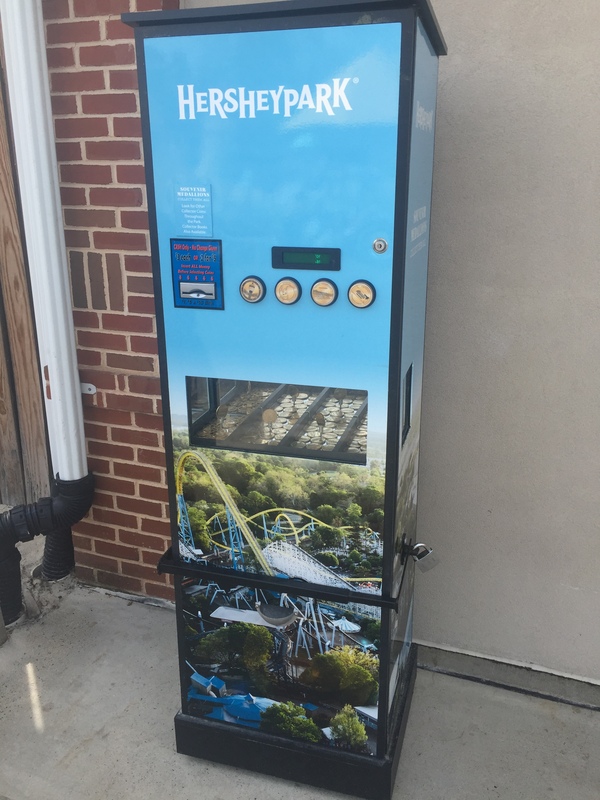 The last machine is back on the other size of the park past Zoo America near the Skyrush Roller Coaster. 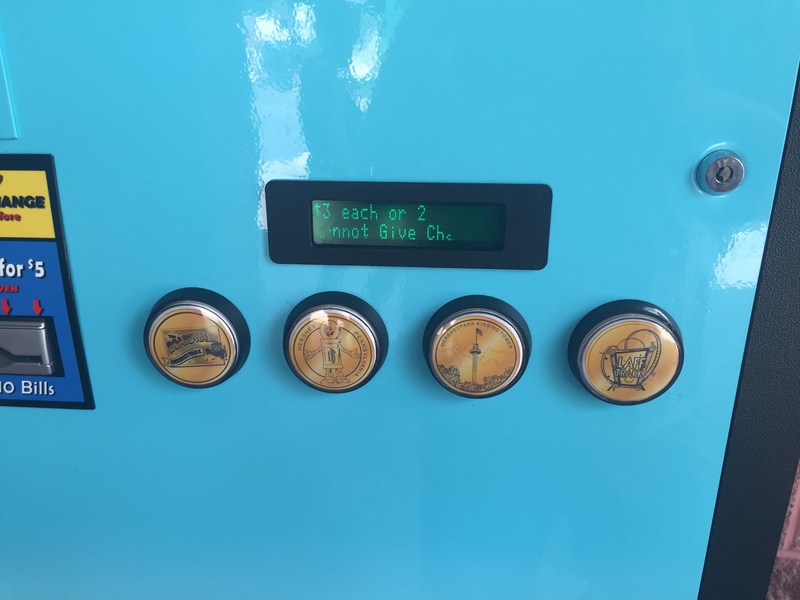 As you may be able to tell from the above picture this machine is located right outside a set of restrooms. This always tends to be a busy area with not a lot of extra standing room for people waiting for their family members. Plus you get some strange looks when trying to take pictures of the penny machine as people are exiting the restroom doors. This final set has designs of a The Claw, Fahrenheit, Skyrush, and a Train Engine. 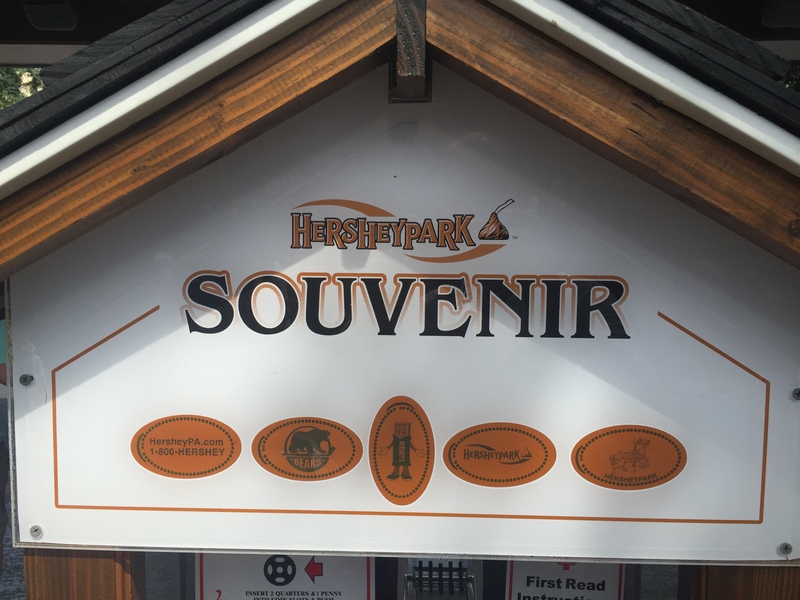 The first three designs are all thrill rides located in the park. 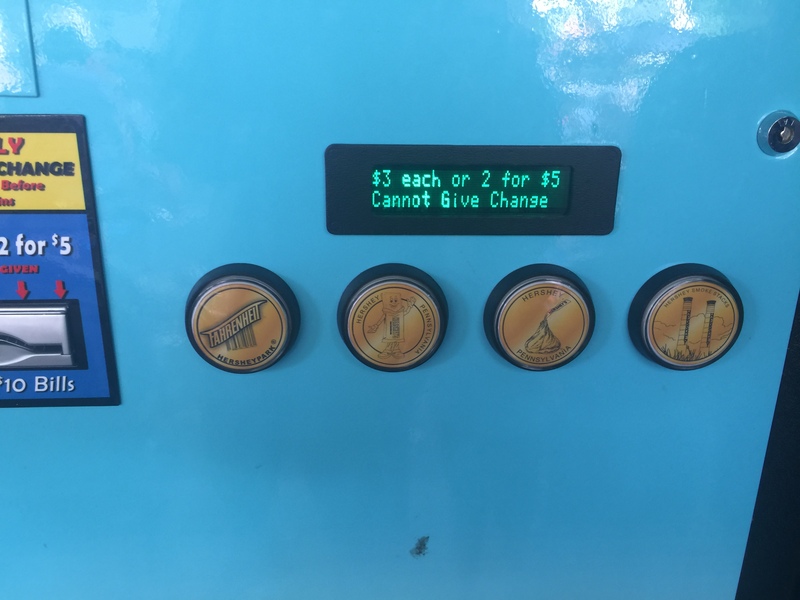 That concludes all the penny machines in the park, however as I was wondering around I came across 4 new Medallion machines. These are not really my thing (I spend enough on pressed coins) but thought I would mention these just in case anyone does collect them. The cost for these were $3 each or 2 for $5. 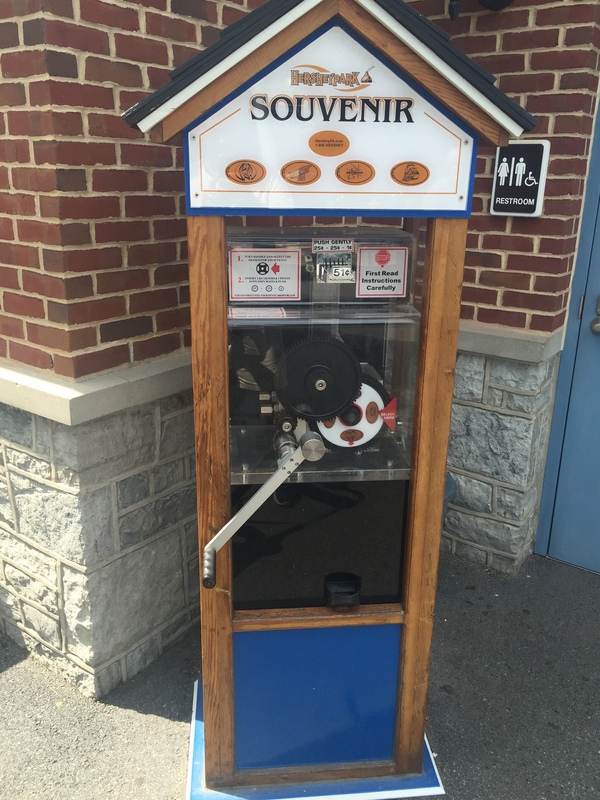 The first one was located near the restrooms by the carousel. 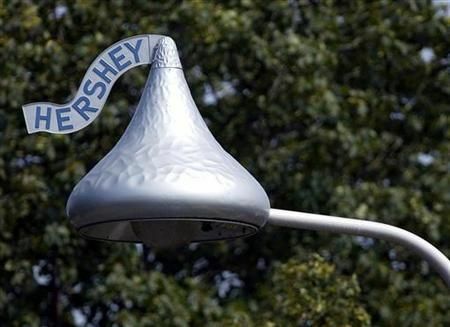 The designs were a Carousel Horse, Milton S. Hershey, a Hershey Kiss Lightpole, and Hershey Chocolate Bar. The second machine was over near the Wildcat Roller Coaster. 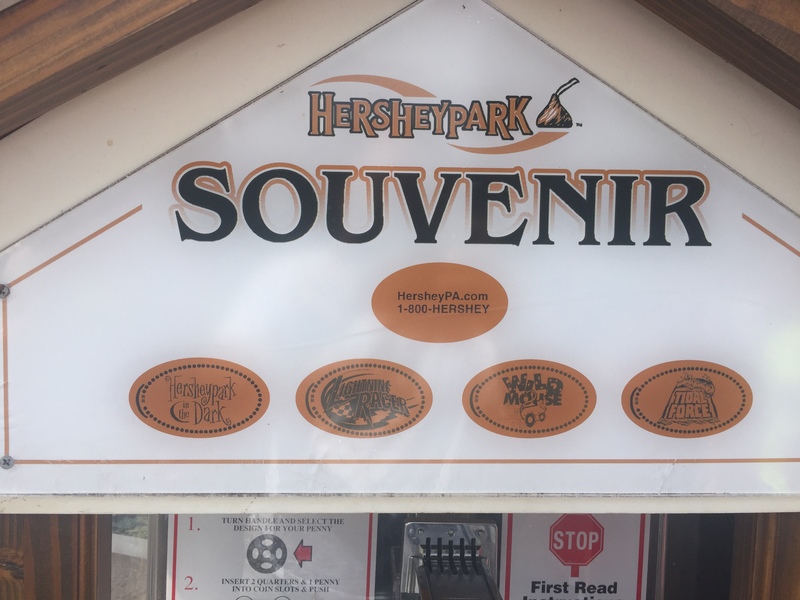 This set of Medallions were of Hershey The Sweetest Place on Earth, Ms. Hershey Kiss, Cocoa Bushes, and Reese’s Peanut Butter cups. 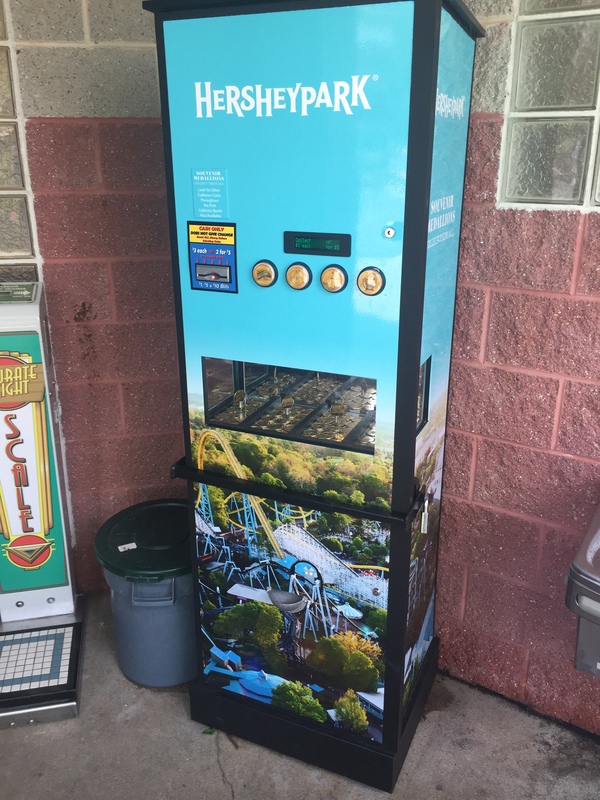 This third machine was available in the area near the Zoo America entrance, by the restrooms at the Loft Catering. This set has pictures of Fahrenheit, Mr. Hershey Chocolate Bar, a Hershey Kiss, and the Hershey Smoke Stacks. 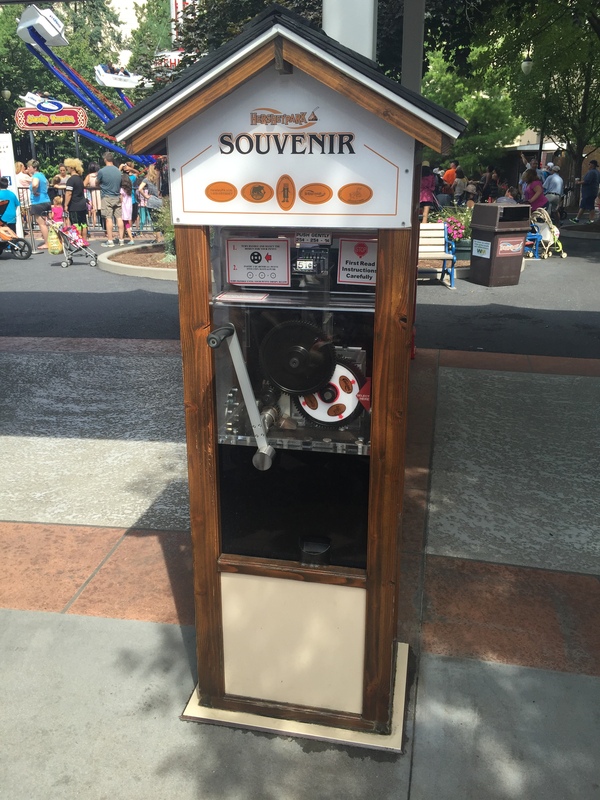 Finally the fourth Medallion machine was located by the restrooms near the Chevrolet Music Box Theatre. 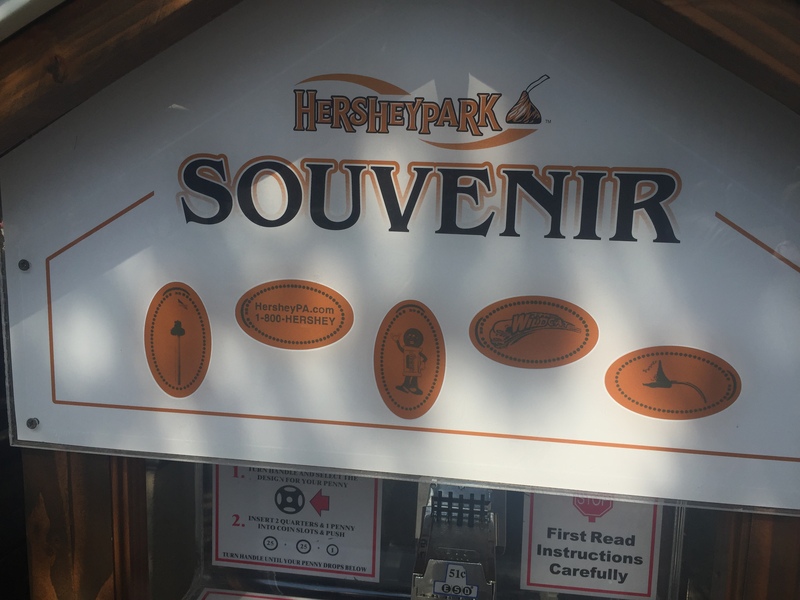 This set included the Hershey Park Boardwalk, the Reese’s Peanut Butter Cup character, the Kissing Tower, and Laff Trakk. With all the penny (and Medallion) machines photographed and documented for my collection it was time to head back and see how everyone was doing in the water park. As usually Hanna didn’t want to leave but with the promise of chocolate on the way out she reluctantly agreed to dry off and start our trip back home. 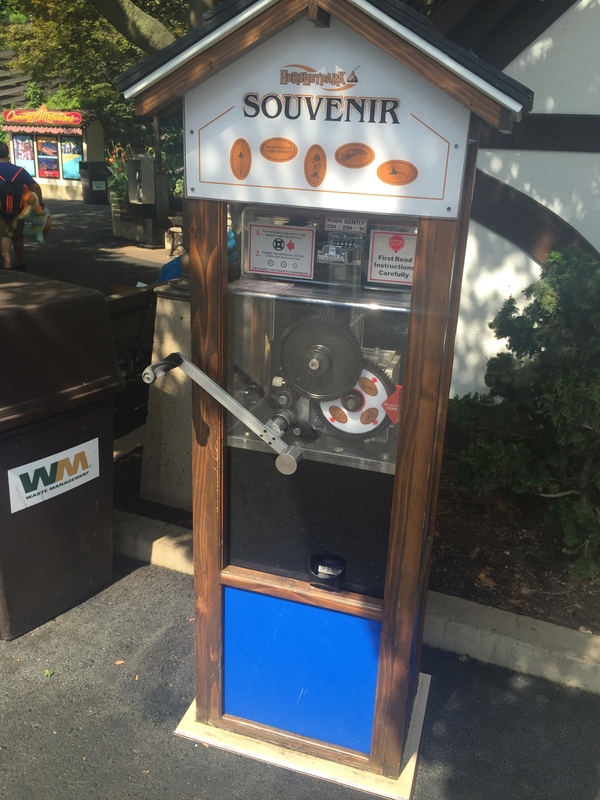 This is a really great place to enjoy a day of rides, food, chocolate and pennies. How does that not sound like fun!